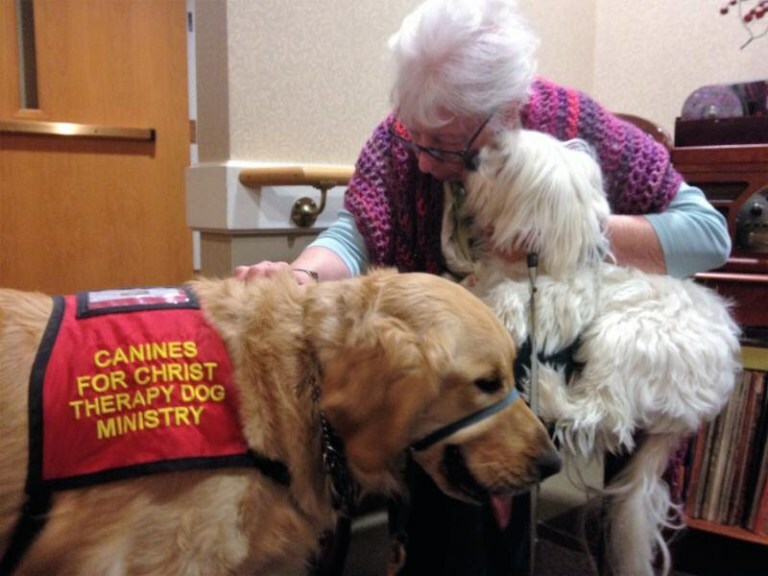 Canines for Christ is an animal therapy ministry. Volunteers and their dogs visit people in cancer centers, children’s homes, nursing homes, hospitals, prison ministries and other places where people are in need of God’s comforting words and the unconditional love and affection dogs can bring. Chaplain Larry Randolph started Canines for Christ in July, 2007. It has grown to over 300 volunteers in the Tampa Bay region. The teams visits over 60 centers in the area, including Brighton Gardens, Connerton Court – New Tampa, John Knox Village, James A. Haley Veterans Hospital, Shriners Hospital for Children, Hope Lodge at Moffitt Cancer Center, and Gulfside Center for Hospice Care. If you are interested in becoming a volunteer, you must complete an application, are required to have a certificate of health completed by your veterinarian, provide the AKC Canine Good Citizen or Therapy Dog Certification, and sign a liability waiver. Dogs must be two years old to enter the ministry, well-mannered, and non-aggressive. Volunteers must be Christians, share God’s message of love and hope, and, of course, be willing to spend time to visit with the patients. Canine for Christ volunteers are needed for an upcoming event at a camp for people with disabilities. Volunteers can choose from Monday, May 29, from 2-4pm or Tuesday, May 30, from 1-3pm. The camp is located at Lake Aurora Christian Camp, 237 Goldenbough Rd, Lake Wales, Florida 33898. For more information, go to www.k9forchrist.org, call 813-968-3983 or find them on Facebook at https://www.facebook.com/c4ctherapydog.